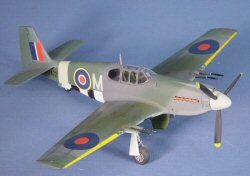 Accurate Miniatures (AM) has released this aircraft in a number of pre-P-51D variants before the ‘old’ company crashed and burned. As the ‘new’ AM has been coming online, it is re-releasing these kits and producing new variations with the associated parts and decals. These new variants are currently recognizable by, shall we say, box art that is not the quality that adorned the releases of the old AM. For those of you who’ve built AM kits before, you know that these kits raised the bar in the plastic model industry for detail and quality straight out of the box. Even the packaging was a step or two above the rest of the industry. The new AM has not only retained the quality of kit and packaging, they continue to improve upon the process to ensure that all of the parts arrive on your workbench without scratches or other damage. On the other hand, the instructions are worse than before. I pulled out an old set of Mustang instructions from one of AM’s early releases and remembered that these were not very well illustrated back then. The instructions in this Mustang Mk.IA kit are based on the old instructions, but it appears that the diagrams have been combined, making parts placement even more confusing if you’ve never built this kit before. Fortunately the assembly of the kit is straightforward and I used the old instructions and dutifully dropped the new instructions into the shredder. AM needs to improve these ASAP. Assembly starts (as usual) with the cockpit. I sprayed all of the interior parts with RAF Interior Green. Since the sidewall frames and associated black boxes and controls were cleverly molded as separate parts from the fuselage sides, I decided to shade the green on the fuselage sides with a light coat of Tamiya Clear Smoke to add depth to the final product. After painting all of the details in the cockpit and adding seat belts & harnesses to the pilot’s seat, I assembled the cockpit and fuselage. The wings go together nicely, and attaching these to the fuselage revealed no gap/seam problems. Excellent! I finished assembly of the kit with all of the parts save the landing gear, pitot tube and guns. These would all go together after painting and decals. I followed the instructions for painting, using Dark Green/Ocean Gray uppers and Medium Sea Gray undersides. 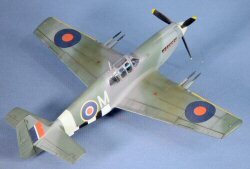 The spinner and fuselage ID band were painted Sky, the invasion stripes white and black, whilst the leading edges of the wings were painted yellow. While some of these features like the invasion stripes were provided as decals, I elected to paint these myself. 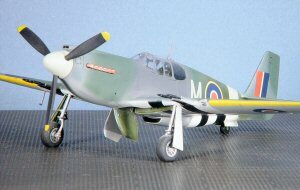 The fuselage was given a coat of gloss white as a base coat for the invasion stripes and to look for any seam problems. 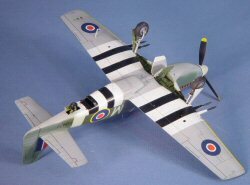 When this was dry, I masked off the areas for the invasion stripes and applied a coat of sky where the fuselage ID band was located as well as on the spinner. The fuselage band was also masked off after it was dry and the camouflage was applied. Between each color, the model was set aside to dry, then buffed with an old t-shirt to a smooth finish before applying the next color. Once these three colors were on and dry, I removed all of the fuselage and wing masking, and then reapplied to new masks to apply the black stripes for the invasion stripes and the yellow ID wing leading edges. All masking used the excellent line of Tamiya masking tapes. The kits decals were used for this project and these were in register and were applied using Microscale’s MicroSol/MicroSet with absolutely no problems. Once the decaling was completed, the model was set aside for the night to dry, and then cleaned of any residual decal adhesive that usually collects under the model. A coat of Future, was applied to provide a nice protective coat for the next step. The panel lines were given a wash of thinned black oil paint. Once this was dry, the excess was buffed away leaving nice subtle details. A coat of Future, mixed with Tamiya Flat Base was applied to provide a nice flat protective coat. The landing gear and other details were finally added to the model. Care must be taken as these gear struts are delicate and are easily broken. 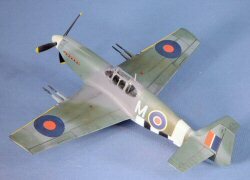 The Accurate Miniatures early Mustangs are the best kits of the pre-P-51D lineage in any scale. The ease of assembly and detailing are second to none. 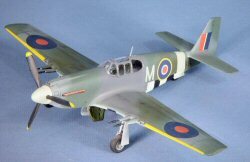 While I would recommend this kit to beginning modelers due to the ease of assembly, the kit instructions limit my recommendations to more experienced modelers at this time. I do hope that AM will improve these soon as this kit is otherwise an easy build. My sincere thanks to Accurate Miniatures for this review sample!